Seahorses are among the marine animals that can change color. Such changes camouflage the creatures if not confuse or even frighten potential predators. Color changes help seahorses communicate emotions and intentions, especially during courtship. While these transformations are beautiful and often appear seamless, they are actually the products of complex interactions between the seahorse's brain and tiny organs carried inside its skin. Seahorse oraganelles, called chromatophores, are embedded within their skins. These tiny, sacklike organs contain a number of pigments and can expand or contract in response to a variety of stimuli, causing the seahorse to change color. Typically, seahorses carry only a handful of chromatophore varieties, and so different colors are created through the mixing and matching of available pigments. All of the colors to which a seahorse can change are derived from three or four basic pigments contained in different chromatophores. The pigment cells of these chromatophores are usually stacked on top of each other or clustered together in groups. The color a seahorse displays is based on type, combination and concentration of these cells, as well as their proximity to the skin's surface. Muscles attached to chromatophores can push pigment cells toward, or pull pigment cells away from, the surface of a seahorse's skin. When the pigment is close to the skin's surface, the animal's color is brighter and more brilliant. In turn, when the pigment draws away from the skin's surface, the resulting color is less saturated and somewhat dull. Depending on the stimulus that causes a seahorse to change its color, chromatophores are controlled by the seahorse's nervous system or by its hormonal fluctuations. When the nervous system activates chromatophores, such as in life-or-death situations, the animal's color changes rapidly. 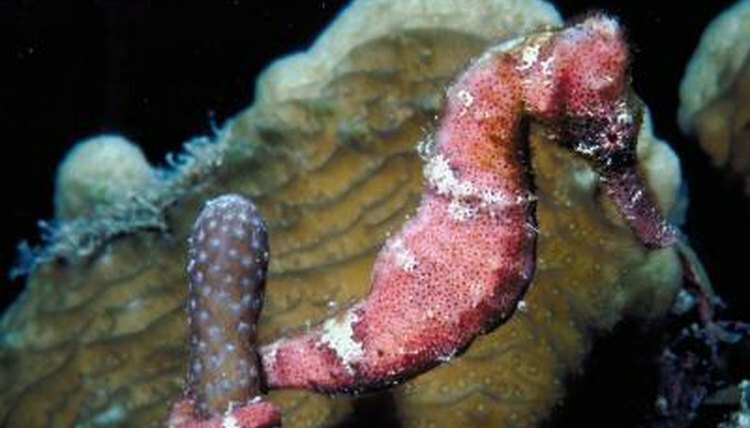 When chromatophores are activated by hormonal fluctuations, such as when a seahorse is courting a mate, the animal's color instead changes somewhat slowly.